Bhutanese community used the Trailhead Direct service to travel to Mt. Si. Photo Credit: Allan Kafley, ECOSS. Over the summer and autumn of 2018, ECOSS led 65 hikers from diverse communities on hikes throughout Washington! For numerous hikers, these trips were only possible thanks to Trailhead Direct, a service launched by King County Parks and King County Metro. Many immigrant and refugee communities around Puget Sound yearn for opportunities to connect with nature, but face language, cultural and lifestyle barriers to accessing the outdoors. Transportation access is one of the greatest of these barriers. “Trailhead Direct is a great way to protect our environment by not driving personal cars.” — Bhutanese community member. King County’s Trailhead Direct service seeks to lower the transportation barrier by providing an affordable alternative to driving to faraway hiking destinations. At the same price point as any other bus ride in the city, a Trailhead Direct bus will drop you off and pick you up at trailheads at Issaquah Alps, Mt. Si and Mailbox Peak. And by partnering with ECOSS, Trailhead Direct reached communities in 2018 that would otherwise have never heard of this transportation option. Trailhead Direct enabled the Cambodian community to bring all family members hiking, from youth to seniors. Photo Credit: Sophorn Sim / ECOSS. To help King County learn about the accessibility of Trailhead Direct and improve the service, ECOSS led hiking trips via Trailhead Direct with members of the Bhutanese, Cambodian, Korean and Latinx communities. 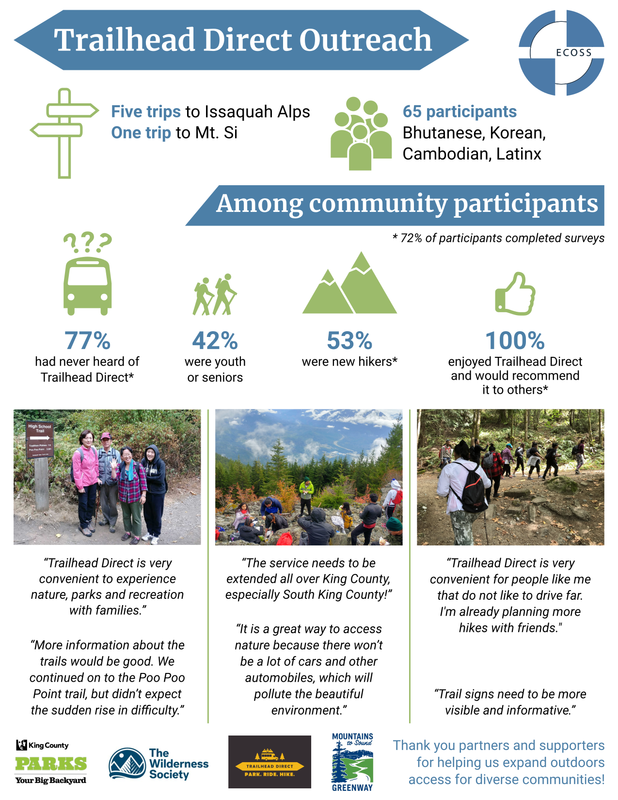 In partnership with King County Parks and The Wilderness Society, we also developed surveys that gauged participants’ outdoors experience and solicited feedback on the Trailhead Direct trips. During our outreach, 53% of hikers were new to the activity and 42% were youth or seniors. And regardless of age or experience, all hikers enjoyed Trailhead Direct and would recommend it to others. Check out our infographic summarizing the season’s outreach for other statistics and feedback from communities! ECOSS’ New Arrivals program connects immigrants and refugees with environmental education and outdoor experiences that align with their interests. We look forward to continuing partnerships to ensure diverse communities can take advantage of Trailhead Direct service. Thank you to King County Parks and The Wilderness Society for your generous funding and support. And thank you to Mountains to Sound Greenway Trust for connecting us to the opportunity to conduct this outreach. We’re proud to lower the transportation barrier to the outdoors and enable connections to nature for all.